All previous MUB commentary can be viewed by clicking here or the MUB tag below. Randy, thanks very much for the MUB idea. I think you’re right. And as an anecdotal comment, I have been struck in recent months at how many people have told me that there is only one good income investment left — high yield munis! Do you know anything about the credit rating on MUB? If it’s high grade, then perhaps there is a tradable ETF for the junk? I’m going to look into that and see what I can find out unless you already know? I think this one is very interesting. I like it when the technical coincide with a contrarian take on what has become “common wisdom”. 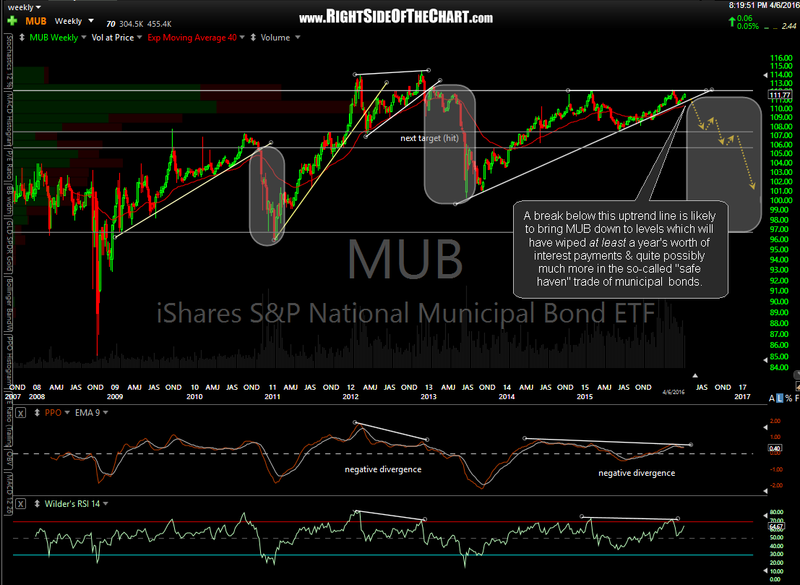 schooner- Like minds, as usual ;-) I did look into that I believe there were one or two hi-yield muni ETFs plus a ton of mutual funds but I’ve been following the MUB chart (which I believe is mostly or all investment grade) & find it most compelling. I also wanted to share it not so much as a short idea, as it wouldn’t be very cost effective to short a security that isn’t expect to fall much in percentage terms plus, pays out a decent dividend. More so, I wanted to give a heads up to those that might have a significant amount of their portfolio in muni bonds as a stop-loss might not be a bad idea at this point. Have to run out for a bit, back soon. Nice one and fits in with the theme of debt troubles all around. I think the debt woes globally will be the ultimate unraveling of things including equity things. Flocking to what they think is the current flavor of safe. It’s also happening with dividend stocks. I have seen some rotating into dividend stocks over the past year thinking they are reducing their risk only to experience dividend cuts and stock price deterioration which more than wipes out their dividend and puts them in a capital loss situation. Not saying all dividend stocks are going to suffer the same fate but surely more dividend pressure will ensue if more stress comes to equities and economy. Even if dividend does not get cut, underlying will suffer. Buying into something for the dividend with focus on the income only not considering R/R on the underlying holding is missing the big picture of “total return / loss”. Dividend holdings are excellent as long as entry point on the underlying is at the correct underlying R/R ( IMHO ). I know not all income investors can take this approach and literally are being forced due to ZIRP to take on risk like this in search of some necessary income. Sad state of affairs CB’s have created for these people in this regard.